Look most places in this corner of the city and you’ll find the name: Thalia. Thalia Road, Thalia Creek, Thalia United Methodist Church and Thalia Elementary School. Even Thalia Civic League and Thalia Fire Station No. 7. The neighborhood could have derived its name from one of several places. Local writer and historian Deni Norred’s theories? German language, Greek mythology or botany. In German, “tal” or “thal” means valley or dale. Perhaps someone of German descent gave the spot its name, Norred said. In Greek mythology, Thalia was one of the three graces, daughter of Zeus and Eurynome. The Greek word “thaleia” means flourish and bloom, and the name was also given to one of the nine muses. Thalia represented comedy, often depicted with a comic mask, shepherd’s staff and an ivy wreath. In her research, Norred has found no clues as to who gave the neighborhood its name, but the first documented reference to Thalia she found appears in an 1893-94 list of Princess Anne County post offices, she said. The name appears again in 1894, on a train schedule for the Norfolk, Albemarle and Atlantic Railroad. Thalia was one of its stops. “I have no evidence it was ever called anything else,” said Norred, who is working on a book about the community’s history. In early days, the area was home to Summerville Plantation, the summer home of wealthy Norfolk merchant George McIntosh’s family from the early 1800s through the Civil War. At the time, the plantation took up most of Thalia. In 1937, a tuberculosis hospital was opened in Thalia to serve Virginia’s second congressional district, Norred said. Five years later, the hospital and the land around it was converted into Camp Thalia for U.S. soldiers during World War II. In 1944, it changed names to Camp Ashby and became a prisoner-of-war camp, housing as many as 2,230 Germans at its peak, Norred said. Today, Thalia extends from Thalia Creek to Lynn Shores Drive and from the Eastern branch of the Lynnhaven River south to Interstate 264. 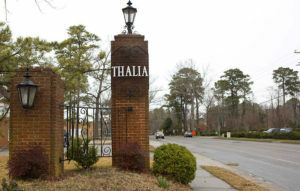 A brick pillar on the corner of Thalia Road and Virginia Beach Boulevard still greets visitors, with “Thalia” printed there in iron.